Text: Asami Miyamura. 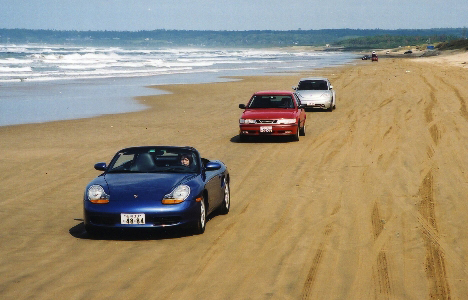 It is one and only beach in Japan where you can drive a car on the beach. It is possible to drive cars by the shore lines, the beach gets tightened as each piece of fine sand absorbs sea water. You can drive with cars like 4WD or big bus, for 24 hours a day. Besides driving, you can enjoy swimming in summer and clamming. Other activities are a fireworks festival, jet ski contest, Chirihama Sand Festival which showcases art pieces made with fine sand of Chirihama. Kaga Music Festival 2014 pre-event "Yamashiro Art Market in Bengaraya"